Technical improvisation in times of war is an artform, and a very good metric of where real capabilities lie. Those who can cobble together a vitally needed resource at short notice, with limited time and budgets, are worthy of admiration - their efforts more than often produce decisive results. If for no other reason this is because the opponent has no idea that a new tool will be used against them. Recent noteworthy examples were the refuelling probes and tanker refits produced for the RAF during the Falklands war, or the run-time software for the TIALD pods deployed during the Gulf War. Pride of place for Gulf War short notice efforts must however go to the Florida based U.S. Air Force Development Test Center (AFDTC - the USAF’s ARDU) and their contractor team for the design, testing, prototyping and operational deployment of the GBU-28 Bunker Buster bomb during the Desert Storm campaign. The ”go” decision for the specific bomb design was made on the 13th February, 1991. The first bomb was dropped on its target on the 27th February, 1991. In TWO weeks the bomb design was prototyped, tested, deployed and used ! This is a remarkable story of focussed technical effort, ingenuity and clever improvisation, and without doubt the shortest development cycle for any production weapon in modern military history. When Saddam rolled into Kuwait in August, 1990, the USAF initiated a massive planning operation to prepare for the very likely prospect of an air war in the Middle East. A major part of that effort was intelligence gathering and analysis. USAF planners were clearly concerned at the number and quality of Iraqi bunkers, many of which clearly would resist the in service I-2000/BLU-109 bunker busting warhead. The BLU-109 was in service with TAC squadrons, fitted with Paveway III laser guidance kits as the GBU-24 for the F-111 and F-15E, and GBU-27 for the F-117A. Western intelligence sources, as well as media drawing on European sources, described deeply buried Iraqi bunkers designed each to house 1,200 troops with provisions for up to 1 month underground. These bunker complexes were buried 30 to 50 feet below ground, comprising many interconnected 8 ft internal diameter reinforced concrete tubes. A typical complex would use a single main corridor tube or ”spine”, with multiple tubes attached at right angles on either side of the spine. Living quarters, kitchens, sick bays, armouries and C3 areas could be accommodated. Entrance was via a hardened chamber, leading to a staircase down to an NBC decontamination chamber, which coupled to the spine of the bunker via a heavy blast door. A two foot thick slab of reinforced concrete was installed immediately above the tubular structures of the bunker. Any conventional bomb which might penetrate the 50 feet of soil would expend its blast against this slab. Some reports suggested that up to forty such bunkers existed in the vicinity of Baghdad, to provide Saddam with the means of concealing up to several infantry divisions of loyal (rather than elite) Republican Guards and a large proportion of his critical command and control facilities. By the end of October, USAF Lt.Gen Thomas Ferguson, the Commander of Systems Command Aeronautical Systems Division, directed the Eglin AFB based ASD Development Planning group to explore alternatives, and produce some long term planning options for hard target weapons. It was however clearly evident that the minimum 10 week timescale would mean that none would be available by the 15th January, 1991, deadline, the time at which war was likely to start. The air war began on schedule, due to Saddam’s intransigence, and early reports of successes were punctuated by a series of alarming reports of bunkers which did indeed resist the BLU-109 and survive direct hits. It was also becoming clear that the Iraqi air force did not have the intestinal fortitude to challenge the USAF and RAF in its own airspace, and therefore air superiority could be expected, therefore allowing much more flexibility in delivery methods. The options for a bunker buster were therefore narrowed down to three weapons, the HTOT with a 20 week timescale to deployment, an Upscaled BLU-109 available in 4-5 weeks and the Dense Penetrator BLU-109, available in 10 weeks. The USAF’s engineers at Eglin proposed a further alternative, a heavyweight bomb dropped from a B-52 at high altitude which would have sufficient kinetic energy to burrow deep into a highly hardened target. In effect this weapon would be a modern equivalent to Barnes Wallis’ Lancaster delivered Tallboys which laid waste to many key German bunkers in the last months of WW2. To keep timescales short, any such weapon would have to make extensive use of off-the-shelf components. The USAF resourcefully manipulated an existing Hard Target Ordnance Package contract held by Lockheed Missiles and Space Company (LMSC), the designers of the BLU-109, and LMSC engineers got to work in late January, researching the problem. Producing a tube robust enough for the bomb body was indeed the crux of the problem, although issues such as delivery and guidance also needed to be addressed. A former Army officer working for LMSC recalled that the Army had stockpiled an appreciable number of M201 SP Howitzer gun barrels, some burned out. Stocks were eventually located at Watervliet Arsenal in NY, Letterkenny Arsenal in Pennsylvania and Ingersoll-Rand’s plant in Texas. On the 25th January the USAF at Eglin requested that the Army ship some of them to Watervliet. The M201 gun barrel was made from a very similar alloy steel to that used in the BLU-109 nosecone and bomb body. Watervliet Arsenal, renowned in the US for their experience in precisely machining gun barrels, was to commence machining the barrels down to bomb bodies as soon as the specifications for the weapon were finalised. 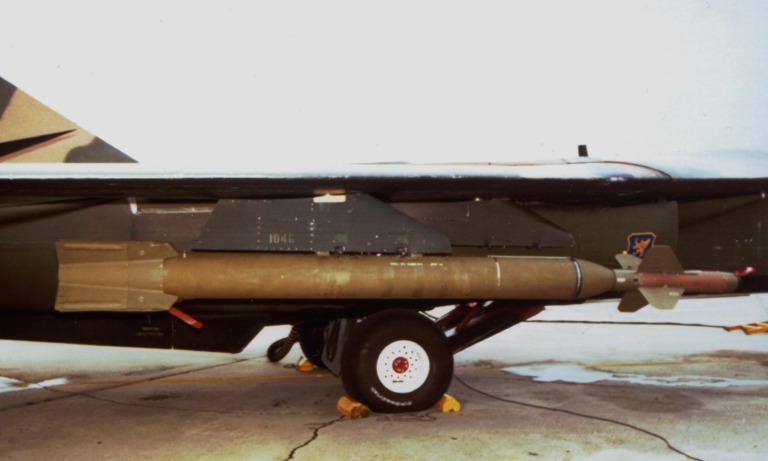 By the 7th February the specs for the bomb design were firming up, and HQ TAC directed Eglin to shrink their proposed 6,500 lb B-52 delivered penetrator down to a size compatible with the F-111 and F-15E fighters. A go-nogo briefing by Eglin was to be presented on the 13th February. The weekend of the 9th and 10th of February saw the USAF engineers at Eglin producing lengthy faxes of technical questions for Lockheed, and for Rockwell, builders of the GBU-15 and maintainers of the F-111 offensive avionic suite. Rockwell responded the next day, Lockheed 2 days later. The Eglin High Explosives Research and Development (HERD) group began a hurried effort to manufacture Tritonal explosive pellets, and gather other needed materials. TI’s engineering manager flew to Eglin and booked wind tunnel time at the LTV Dallas plant. Cameron Forging, manufacturers of the BLU-109 nosecone, were instructed to ship a batch of nosecones to Watervliet in NY. While the engineers burned a weekend producing specs, the Tactical Air Warfare Centre at Eglin worked through delivery concepts and a test plan. Rockwell had proposed a GBU-15 based solution, Lockheed a variant of the TI GBU-24/27. The USAF opted for the GBU-24/27 proposal using a 4,700 lb weapon in preference to 9,000 lb and 7,000 lb alternatives under discussion. Decision time was approaching, and Eglin despatched a team of ten at 04:00 hrs on the 13th February to TAC HQ to brief the brass. Eglin committed to delivering two test rounds and two operational rounds in two weeks. The Vice-Commander of TAC was briefed the next day and approved the go-ahead the same day. By this time TI began cutting code revisions to the existing GBU-24 seeker control laws. By the end of the week, Watervliet received further fired out gun barrels from Ingersoll-Rand, nosecones from Cameron (literally stolen from a current BLU-109 build) and design data from Lockheed. The Watervliet machinists were working seven days a week in round the clock shifts to produce the specified bomb bodies. The gun barrels had to be shortened, the chrome plating stripped from the bores, and external hoops and rails cut off. The barrels then had to be bored out to a 10 in internal diameter to accommodate the nosecone. Attaching the nosecone created more problems, as the inertia welding method used for the 109 was not practical due the much larger bomb body. A tapered cut with a shoulder on the 109 nosecone was designed to mate very tightly with the machined gun barrel. A shrink and weld process was chosen to mate the two components and proved to be successful. Watervliet took 12 hours to assemble the first bomb body, using a shrink process to insert the nosecone which has then welded into position. Multiple threaded holes had to be cut into the body for carriage lugs to be fitted. On the morning of Saturday, the 16th February the first penetrator was loaded on to an USAF Air National Guard C-130, paint still wet, and flown to Eglin. The second followed several hours later. Work on rounds three and four commenced immediately at Watervliet. While these many things progressed, TI had reassembled the design team which produced the GBU-24 seeker for the Mk.84/BLU-109. These engineers immediately built a 1/4 scale model of the GBU-28 for wind tunnel testing. In one week they produced the minimal set of tests needed to characterise the bomb’s aerodynamics, the full test would have taken up to two years of time. With the test data in hand, the engineers ran software simulations to determine the parameters for the bomb seeker’s control laws. Once these were found, bomb seeker software was compiled and a set of EPROMs cut for delivery. On the 20th February a TI company jet flew the first pair of modified GBU-24 seekers to Eglin. Once the bomb bodies arrived at Eglin, the HERD group commenced loading them with explosive. The 13 ft casings were larger than anything previously loaded at Eglin, an R&D rather than production facility. The first step in the loading process was to apply a lining material to the inside of the casing. The liner was employed to insulate the Tritonal from the metal casing to ensure that sparking produced by static electricity would not ignite the explosive. Because the bomb was too large to fit into a curing oven, a custom built heating coil, hot water system and felt jacket were built for the task. The liner compound was poured into the casing, the casing rotated to spread the compound, and then heated for 12 hours to cure the compound. One round was filled with concrete for a sled test, the second round was filled with Tritonal in a 37 hour process. Buckets of molten explosive were poured in by hand. The nose of the bomb was filled with Tritonal diluted with wax, to avoid premature detonation on impact, while the remainder was filled with Tritonal pellets in molten explosive. The casing was 13 ft long, with 2.25 in thick walls, and contained 630 lb of explosive. The HERD team gained experience quickly with the first casing, and subsequent rounds were loaded in much less time. All weapons met the BLU-109 explosive quality specification. Bye bye bunker! This dramatic image shows the first GBU-28 test article milliseconds before impacting the test target at the Tonopah test range. The weapon buried itself so deep during this drop, that the USAF did not bother trying to dig it out. During a rocket sled test conducted at that time, the BLU-113 test warhead punched through a 22 foot thick stack of steel reinforced concrete slabs, to be later found one half mile down-range from the target (TI). By the 18th February, flight line clearance testing was under way. It was found that a thicker ejector foot pad was required to ensure safe clearance, and this was produced and fitted. An F-15E flew initial captive carry tests. Then, between the 19th and 22nd February, an F-111E of the 3246th Test Wing flew a series of captive carry tests to confirm safe handling, flutter and oscillation, assymetric handling and structural integrity. Once this hurdle was overcome, the USAF proceeded to a live drop test and sled test. The Tonopah base was chosen for the flight tests as it was both very secure, and had the deep digging equipment needed to extract buried rounds, as well as preformed concrete targets, all equipment left over from the testing of the F-117A/GBU-27 weapon system. Because only one weapon was available for a live drop, one of the two candidate delivery aircraft was chosen. It was an F-111F of the 431st TES at McClellan AFB. The bomb was dropped at 06:50 on the 24th February, the F-111 crew calling out ”Cola Dive” to confirm a clean separation. The weapon hit the desert floor at supersonic speed and buried itself over 100 ft deep. At such a depth it was decided not to dig it up, the expense in doing so could not be justified. 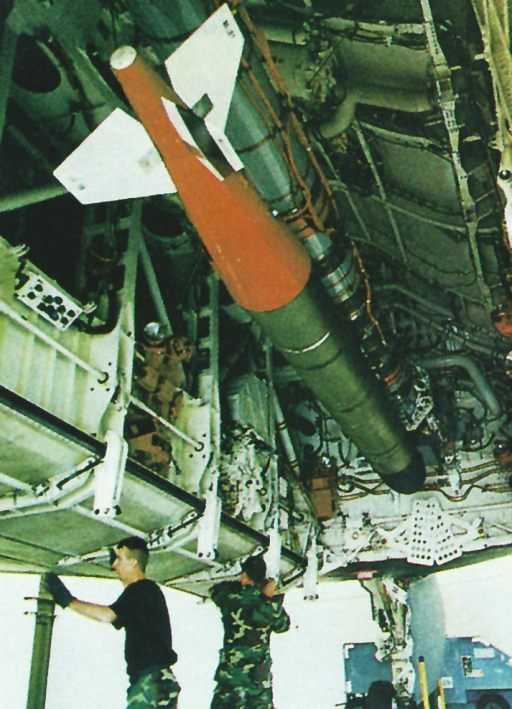 With one test drop the GBU-28 holds the current record for the minimal number of drops to operational deployment, most USAF bombs undergo about 30 drops before deployment, while 90 Amraams were fired before the weapon was cleared into service. 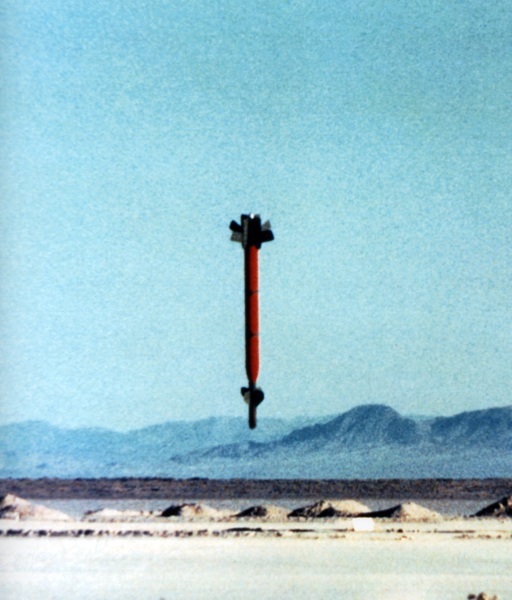 Two days later a rocket sled test was conducted at Holloman AFB in New Mexico. The bomb was fired against a 22 foot thick stack of steel reinforced concrete slabs. It punched through the whole stack and then travelled for over a half mile before it ran out of energy. Once the drop test was completed, TI were instructed to supply a further batch of seeker kits to Eglin. With a pinpoint accurate proportional navigation Paveway III seeker, and a hardened steel casing containing over 600 lb of Tritonal explosive, the GBU-28 is the most destructive precision non-nuclear weapon in operational service at this time. 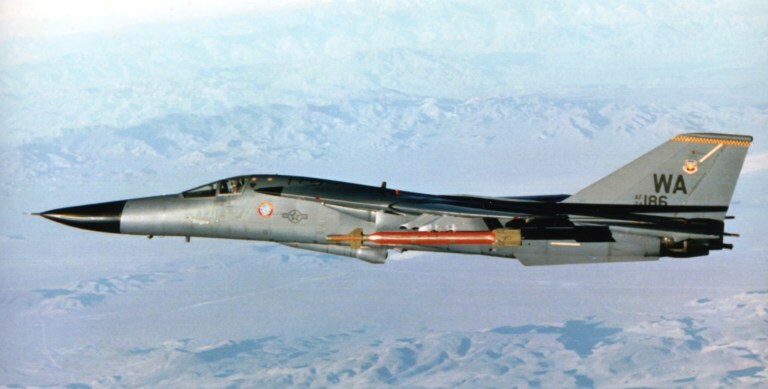 The first successful combat drop was carried out by a Pave Tack equipped F-111F of the 48th TFW in February, 1991, when a single GBU-28 round destroyed the until then impregnable Al Taji bunker near Baghdad (TI). The third and fourth bomb casings, destined for Iraq, arrived at Eglin on the 23rd February and were immediately loaded. Still warm from the explosive loading process, the two rounds were loaded on to a C-141 at Eglin on the 27th February, for the seventeen hour flight to Taif in Saudi Arabia. Within 5 hours of landing these bombs were under the wings of 48th TFW F-111s, en route to Iraq. The 48th TFW was not notified of its special mission until 60 hours before the planned flight. The target was to be a pair of bunkers close to the Al Taji air base, about 35 miles NW of Baghdad. The crews were notified while the bombs were crossing the Atlantic. Initially the commander of the 48th planned to fly four aircraft, two to paint the target with Pave Tack and two to drop the bombs. After some consideration, it was decided that only two bombers would fly. The initial flight plans were scrapped after the 431st TES F-111F WSO (navo) briefed the 48th on the weapon’s idiosyncrasies. The mission plans were revised to account for different run-in headings and release parameters, delaying the mission by an hour. The first bomb took an hour to load, the second 25 minutes. To balance the heavy assymetric load, a Mk.84 slick was hung off the opposite wing of each bomber. At sunset, the two F-111Fs accelerated down the Taif runway on their historical mission. With 45 degree sweep and intermittent use of reheat, the pair climbed out to 19,000 ft, hit a tanker South of the Iraqi border, and entered hostile airspace. As they approached the target, they step climbed with reheat, by their own accounts quite nervous about being tracked by their highly visible plumes. 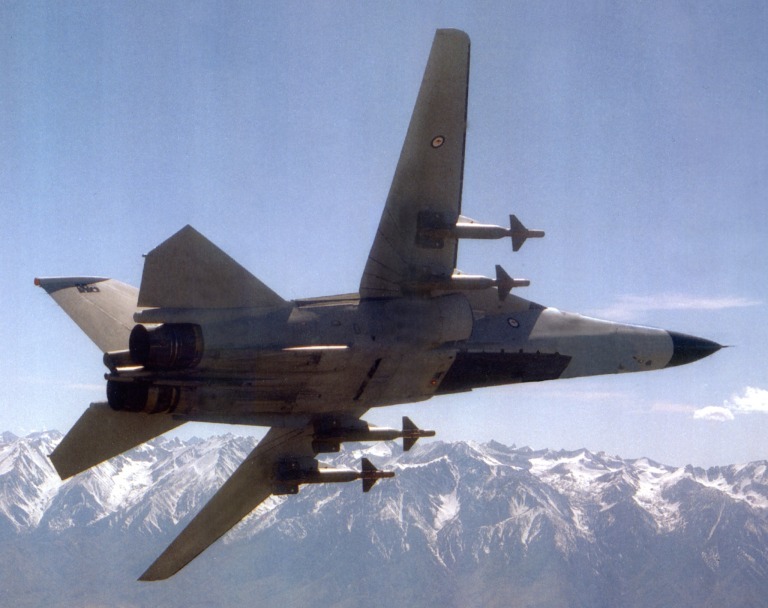 The two Aardvarks were covered by a full package, with F-15C fighter escorts and F-4G Weasels. An offending AAA site enroute was fed several HARMs. The initial plan for the sortie was for both aircraft to run in over the target, the bomber lasing if it could locate the target, alternately the second aircraft lasing if the first could not get a good fix. Once the first weapon was dropped the aircraft would fly a racetrack circuit and repeat the process with the second bomb. Running in to the target the lead aircraft called out a good fix and proceeded to engage the target solo. The number two aircraft passed over the target on the downwind leg of the circuit, when it received a call from the lead to switch from its planned secondary target to the primary, no reason was stated. The number two aircraft failed to get a fix on its first and second passes, but found the target on the third pass. The target was painted with the Pave Tack laser 60 seconds before the drop and throughout the flight of the weapon. The bomb hit the aimpoint, and the Aardvark, lighter by 4,700 lb, turned for home. With one emergency inflight refuelling on the way home, it landed at Taif at 22:15 local time. Needless to say, the first thing done after landing was to rush the Pave Tack footage to the mission planning VCR and observe the results of the attack. The first aircraft had indeed missed the target, and the success of the mission hinged on the second drop. The tape showed that the weapon hit its aimpoint, producing no visible evidence of the hit until seven seconds later smoke began to pour out of one of the bunker’s air vents. This indicated that the bomb had found its way deep into the bunker, devastating it with overpressure and heat. It has been argued that the hasty Iraqi cease-fire on the following day may have had much to do with the Iraqis learning that their last refuge had been defeated. The deep bunkers were no longer safe from the marauding bombers of Tactical Air Command. 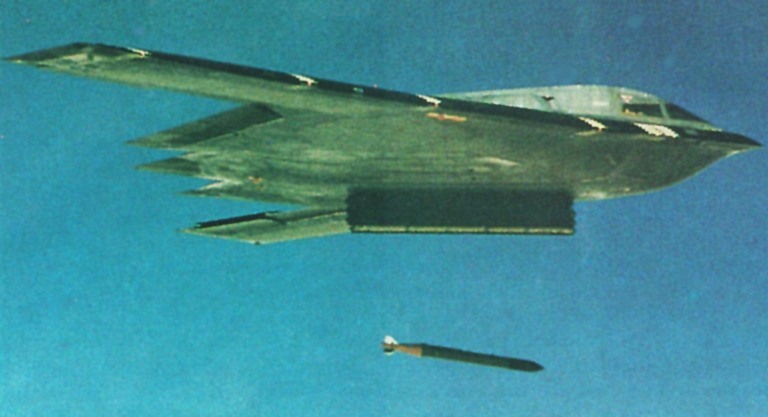 Above, below: GBU-28/B rounds dropped by the F-15E. 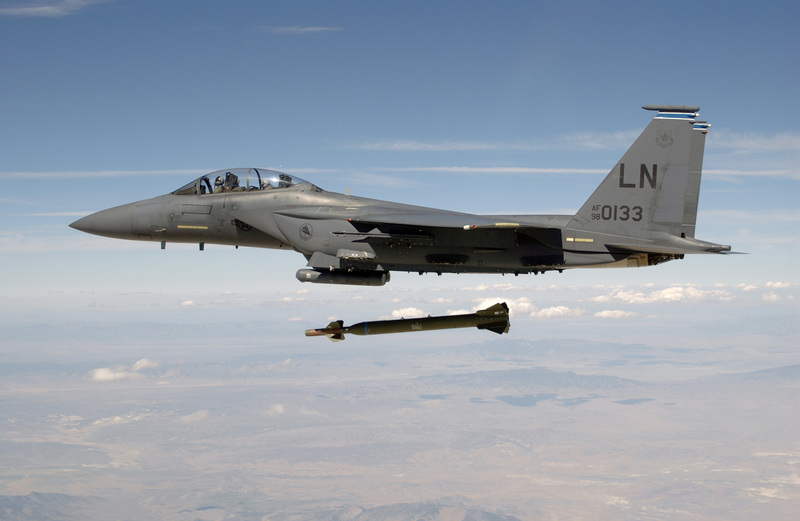 The F-15E is the only remaining fighter cleared to deliver this weapon. With a GPS aided seeker, the weapon becomes the EGBU-28/B (US Air Force). The GBU-28/BLU-113 Hard Target Penetrator is now a standard weapon in USAF service. In the months following the Gulf War, the USAF completed the testing process, TI developed and certified proper software for the seeker, and a substantial stock of warheads was built up. 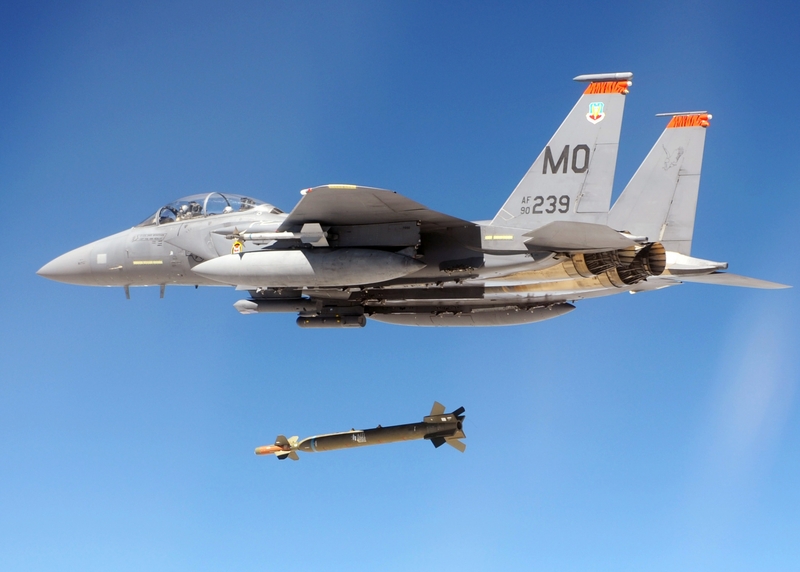 Carried initially by the F-111F prior to its premature retirement, and now by the F-15E, the Bunker Buster can be called upon to do its task at any time. It is indeed an excellent conventional deterrent weapon, as it can crack targets which otherwise would require a surface burst nuclear warhead to take out. Iraq, Iran, Libya and North Korea have been reported in recent years to be expending much effort in digging themselves even deeper underground, producing a boom in world sales of tunnelling equipment. Given the proven performance of the GBU-28, they should probably keep digging ! More recently, Northrop have commenced flight testing of the GBU-37 GAM-113 (formerly BLU-113/GAM), a GPS guided weapon which uses the GBU-28’s BLU-113 warhead and a modified Northrop GAM tailkit to produce a wholly autonomous all weather bunker busting weapon for use by the B-2A. Whilst early studies suggested it would be fitted with midbody wings to improve glide range, the test weapons have none. The GBU-37 GAM-113 has the 20 ft or better CEP of the 2,000 lb GAM and all of the 4,700 lb punch of its laser guided cousin. Virtually undetectable, a Northrop B-2A dropping these weapons could paralyse an opponent’s hardened C3 system with total surprise. A single B-2A can carry up to eight rounds on its internal rotary weapons launcher. The almost undetectable APQ-181 Attack Radar and GPS aided GAM/GATS targeting system provide a true all weather around the clock precision capability. The USAF’s development effort on the GBU-28 is an excellent case study in successful teamwork between an air force and its supporting contractors. Several important points must be stressed. The end result was produced by all players being wholly focussed upon the task at hand. A parallel development strategy was used, so that multiple alternatives were made available at every step in the process. Importantly, the bureaucracy was excluded from the process and the paperwork was treated as a post-event follow-up, rather than the immovable obstruction which it can become in many organisations. The effort was conducted wholly by operators and engineers, and the USAF hierarchy provided the proper support required to push the process through. While the program was high risk by any standards, it also involved controlled or measured risks at every step of the process. Experts were allowed to do their thing with minimal oversight from paper pushers. Indeed this was the recipe behind the successes of Lockheed’s Skunk Works, and most other technically innovative organisations. The fundamental truth is that a preoccupation with minimising risk is not compatible with fast and cheap development work (this the author can state from personal experience managing and leading an R&D office). Such preoccupation is endemic amongst non-technical or semi-technical managers. The GBU-28 project is a shining example of what can be achieved by a focussed effort, good technical skills and clever risk management. In the Australian context the GBU-28 must be seen as a specialised but potentially valuable weapon, particularly should the need arise to defeat a well dug in opponent. Certainly should this weapon be required at any time, its introduction would be very simple as the GBU-24 seeker is in RAAF service and the weapon is thoroughly proven on the F-111. The issue would rather be one of availability to FMS customers. The political implications of the RAAF possessing a weapon capable of killing enemy leadership in virtually any bunker would almost certainly keep our DoD committees and bureaucrats occupied with a debating topic for months if not years. So, if you are seriously planning to go to war against the Western Alliance, make sure you bury everything at least 200 ft deep in solid rock! The baseline GBU-28/B seeker is now being replaced with a GPS aided variant of the Raytheon GBU-28/B seeker. The baseline BLU-113 is being replaced now with the BLU-122/B warhead under the BLU-113 PPI effort. The new weapon is designated the EGBU-28C/B. It is currently intended for carriage on the B-2A and F-15E. The issues is this paper now have a broader scope with the proliferation of Russian designed bunker busting variants of the KAB-500 and KAB-1500 series weapons. The RAAF has now deployed the smaller cousin of the GBU-28, the 2,000 lb GBU-24 equipped with the BLU-109/B (I-2000) bunker busting munition. This smaller weapon was the mainstay of the Gulf War bunker and HAS busting effort, accounting for the lion’s share of the several hundred bunkers and shelters cracked during the air campaign. The photo depicts A8-132, the AUP prototype, during recent trials conducted from McClellan AFB in California (USAF). The GBU-37 GAM-113 weapon employs the BLU-113 penetrator and a modified Northrop GBU-36 GAM-84 GPS inertial guided tailkit. The weapon has the ¡ 20 ft CEP of the 2,000 lb standard GAM-84, and the punch of the GBU-28 warhead. The B-2 can carry up to eight GBU-37 GAM-113 munitions on its internal rotary launchers, providing the aircraft with a near precision all-weather autonomous capability to destroy hardened targets. A single B-2 can thus cripple the core of any nation’s Command-Control-Communications (C3) network with total surprise and total impunity [Editor's Note 2005: The GBU-37 GAM is being replaced by the EGBU-28, using a GPS/inertial enhanced variant of the GBU-24/28 seeker] (Northrop-Grumman).